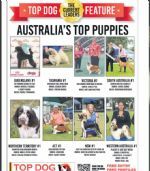 Molly Jones & Pork Chops advertised in the December 2017 issue of the Dog News Australia magazine. 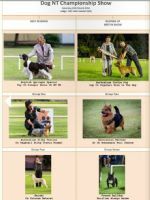 Porky was crowned #1 ALL SYSTEMS in 2017! 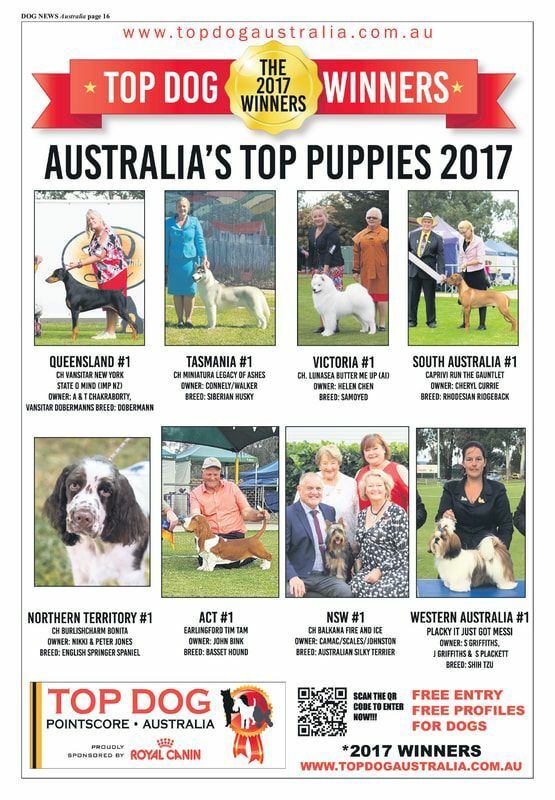 She was #1 All Breeds 2017 DNA P/Score & also #1 Eng Springer Puppy NATIONALLY in the DNA P/Score AND #1 in the DOL Rising Star 2017 NT ALL BREEDS P/Score! 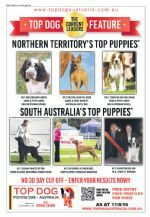 Not a bad feat at all as she was only eligible for both competitions (age wise), for half of the year. 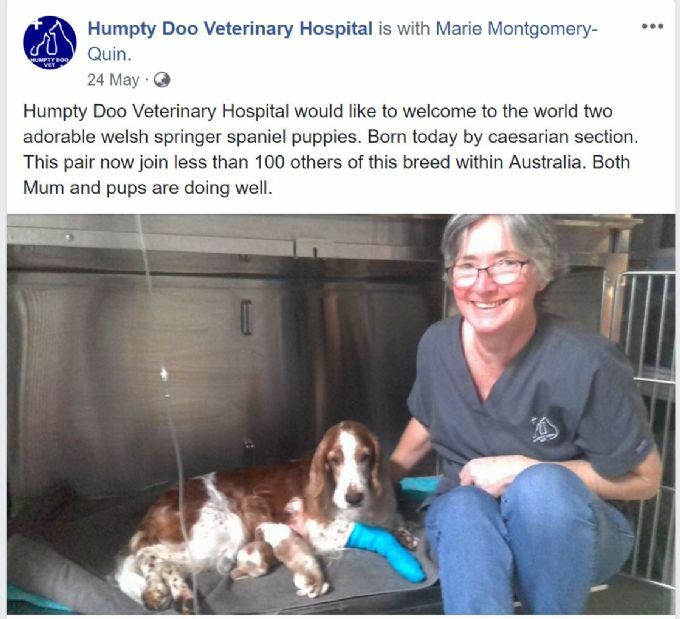 Windy Pops & Pagan were born by C Section at Humpty Doo Veterinary Clinic & made FB news. 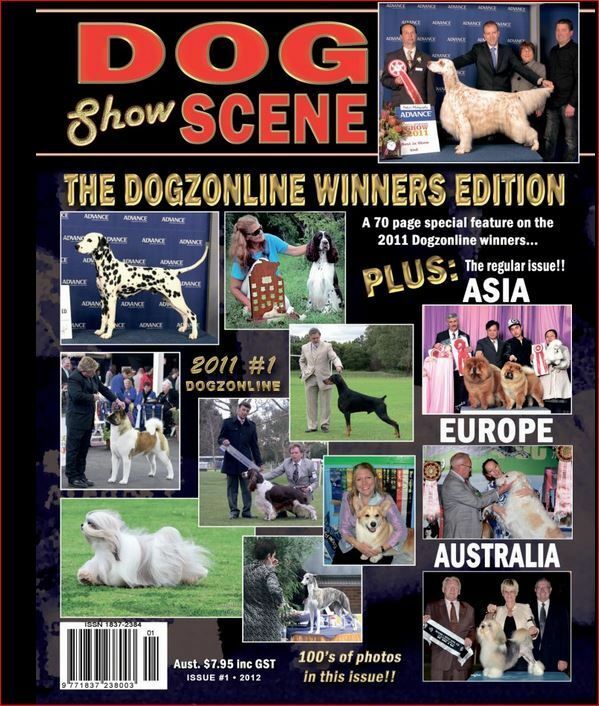 'Meazle' is listed & publicly applauded again, this time in the 'Top Dogs Dog News Australia competition 2014'. 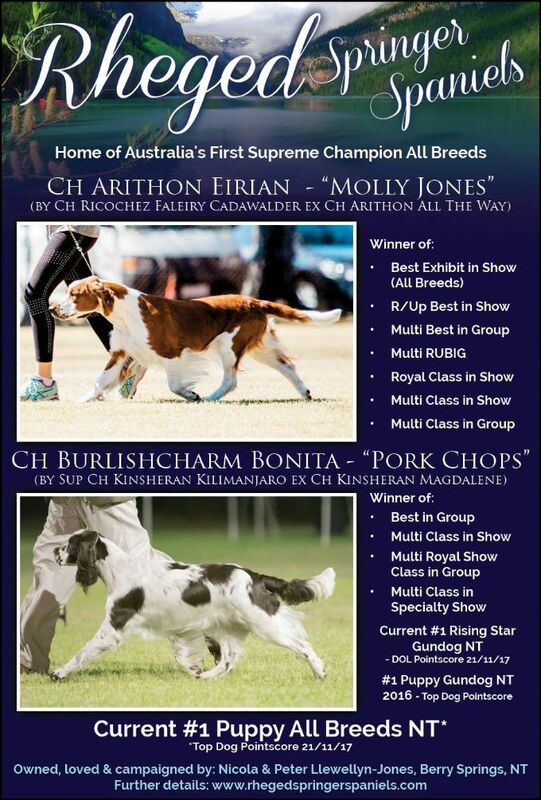 Beautifully handled in this photo (RH corner) by Julz Lalor of 'Hounsley Beagles'. 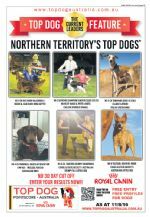 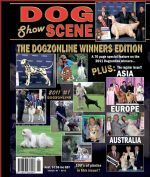 Meazle & Nikki - pictured centre - on the Front Cover of the special 'Winners Edition' of the National publication 'Dog Show Scene 2011'. 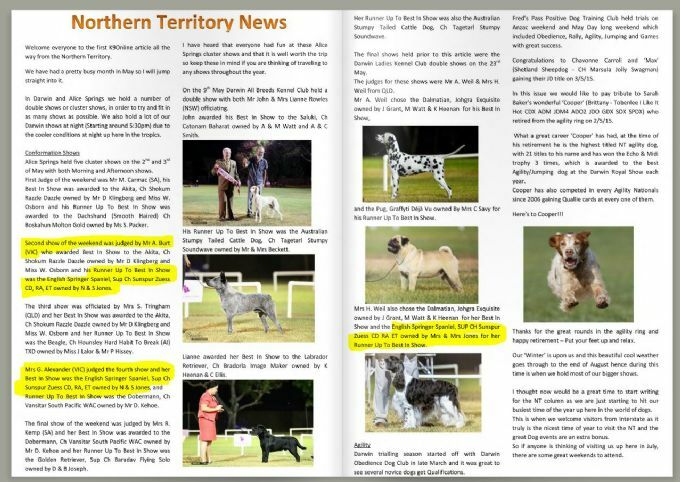 Tally (Supreme Champion Ricochez Auryn Talyessin CCD CD RN RA RE RAE), featured here with Nikki winning 'Best In Group' & 'Best Australian Bred In Show' at the Royal Darwin Show 2013 ~ appearing in a canine press release July 2013. Judge: world renown Springer Spaniel expert Mrs. Marie Merchant (SA). 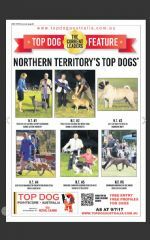 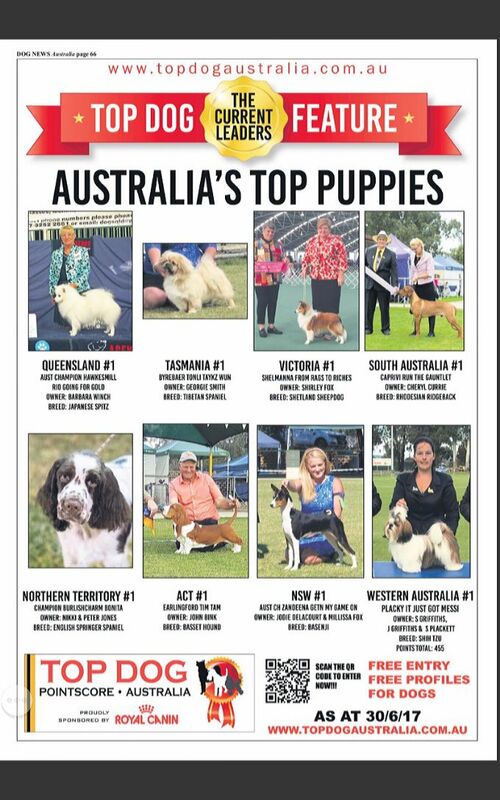 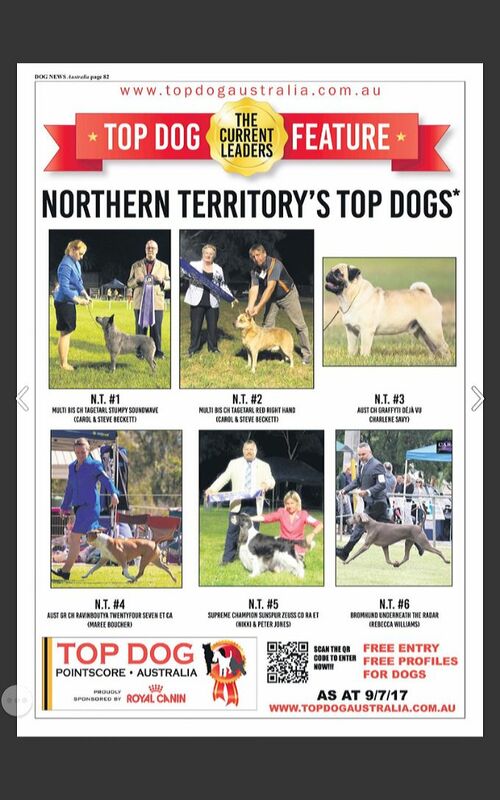 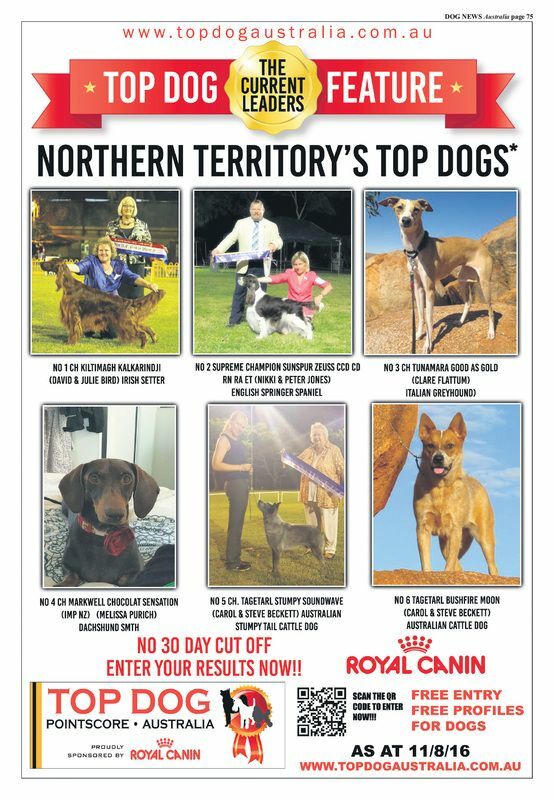 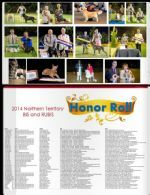 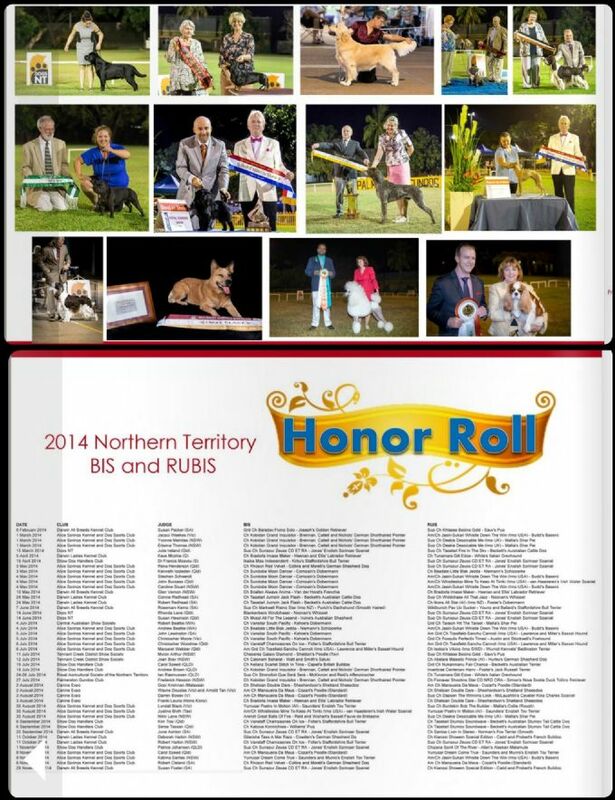 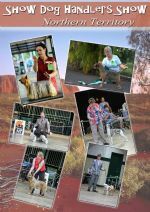 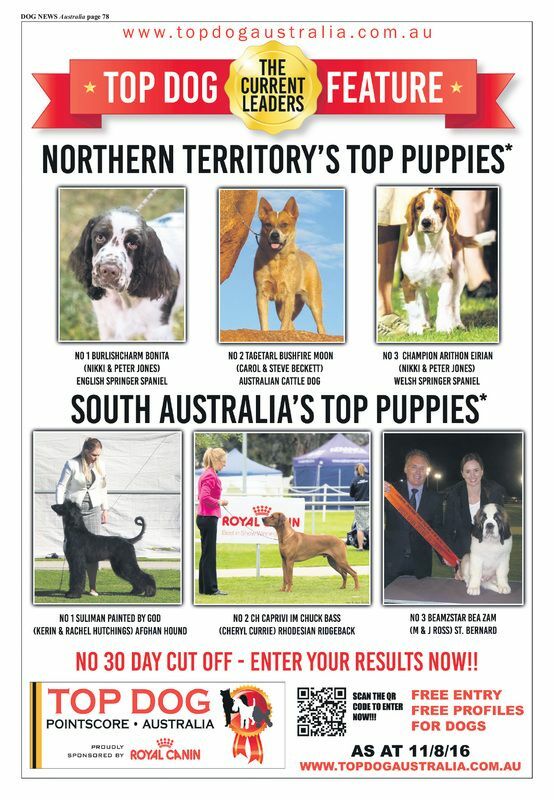 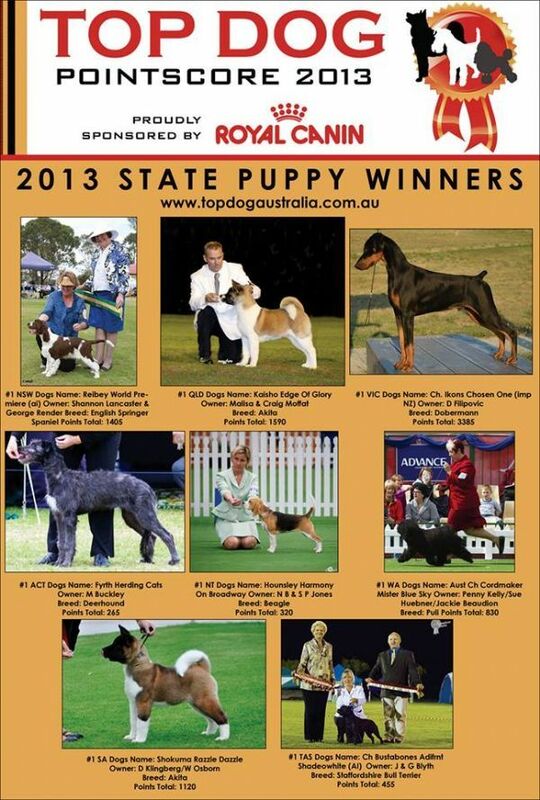 Hatti Beagle ('Supreme Champion, Dual Grand Champion (Track & Search), Dual Champion (Tracking) Hounsley Harmony on Broadway' & Breeder/Owner Julz Lalor #1 All Breeds 'Top Puppy Australia Royal Canin Pointscore' NT 2013 ~ here featured in a National Canine press release. 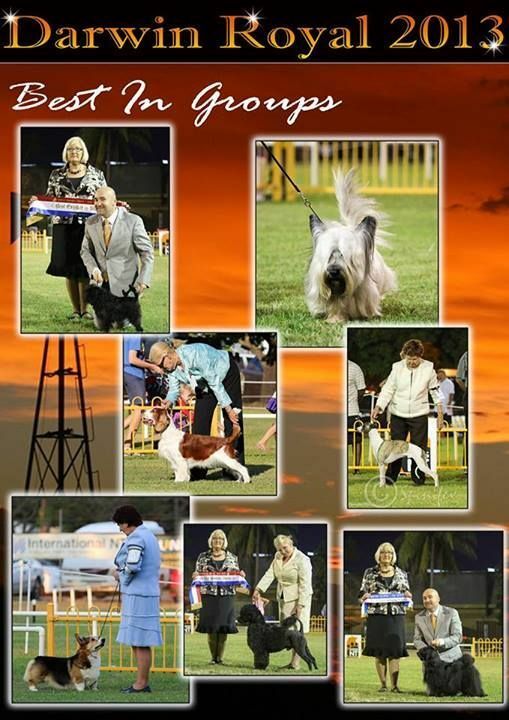 Zuess - starting 2016 off with a BANG! 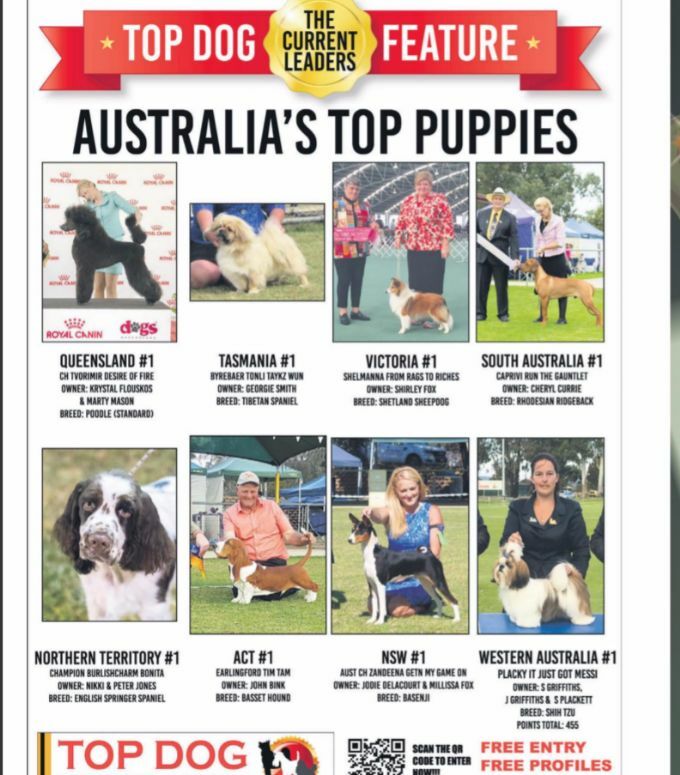 Here pictured with his peers as #1 Gundog in February 2016. 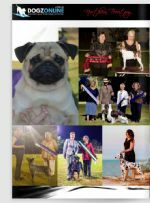 Picture: 'K9online' Magazine March 2016. 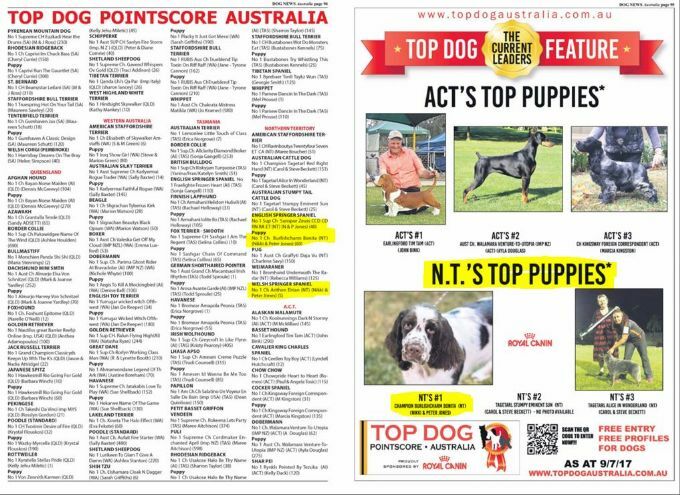 'Meazle' here sitting in the #2 position on the 'DNA Top Dog Australia Pointscore' as of September 2016. 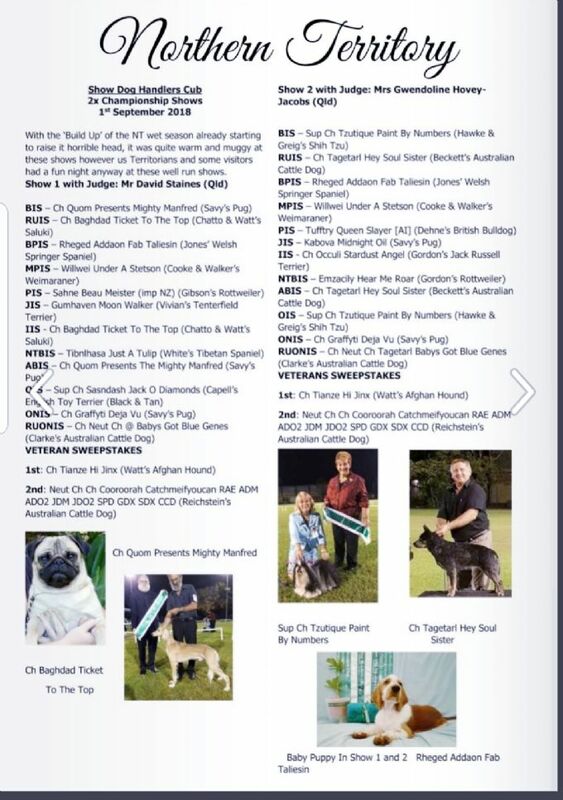 Three of our Spaniels winning awards again! 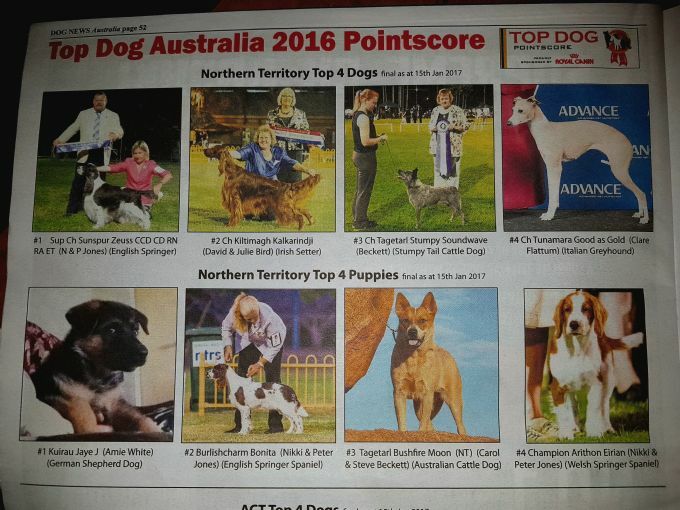 DNA POINTSCORE 2016. 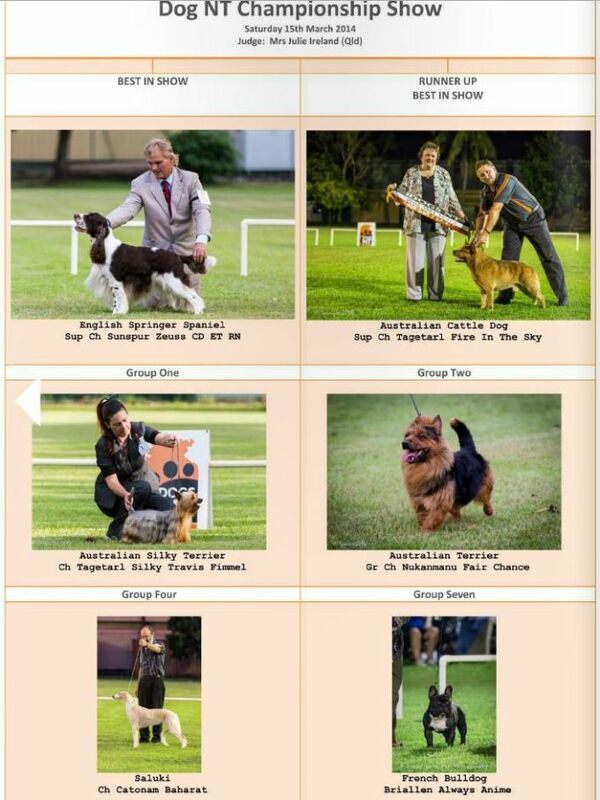 Meazle was #1 All Breeds again, MeMe came in at #2 Top Puppy & Molly at #3! 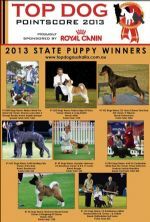 Pork Chops (Ch Burlishcharm Bonita), sitting comfortably at #1 Puppy (NT) Going into July 2017. 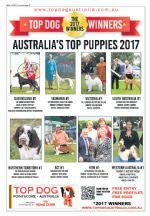 Even though 2017 saw Meazle semi retire & only compete in a handful of shoes, this wonderful dog still sat at #5 (NT) in July 2017. 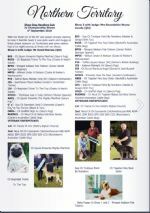 By far more than twice the age of his competition - Meazle still trotted out to secure both BEST EXHIBIT IN SHOW & R/UP BEST EXHIBIT IN SHOW wins plus BEST EXHIBIT IN GROUP & R/UP BEST EXHIBIT IN GROUP awards. 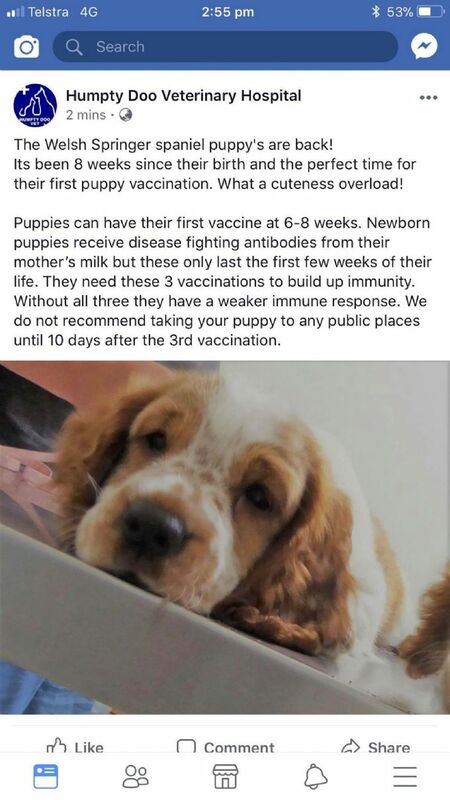 What an amazing boy. 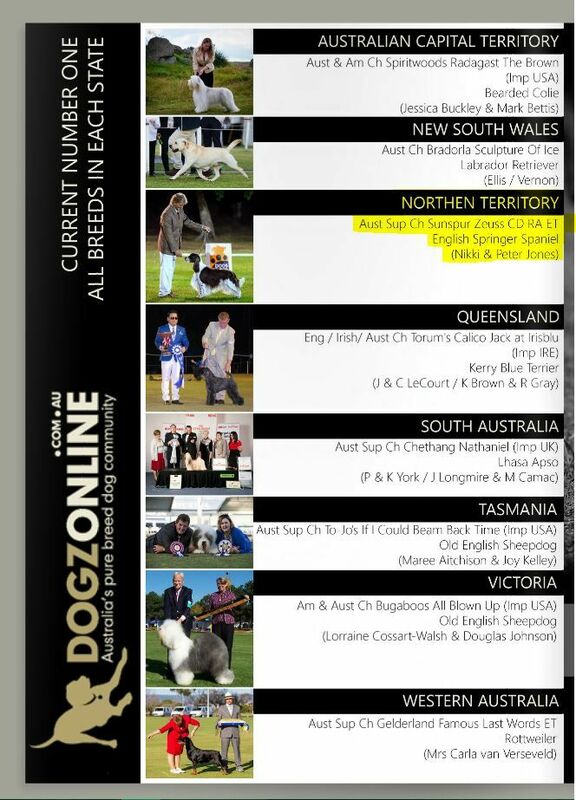 Our gorgeos Pork Chops (pictured) featuring as #1 Rising Star All Breeds as of Oct 2017 on the Dog News Australia Poinstscore & evergreen Meazle plus Molly Jones the loopy Wlehsie also get another mention in the text. 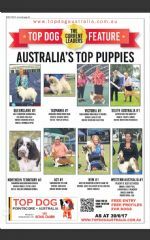 Zuess being mentioned 3x in a Press roundup of the month of May 2015. 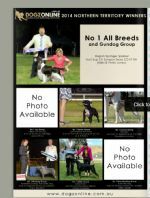 He was sashed 1x BEST IN SHOW & 2x RUNNER UP BEST IN SHOW awards in this month alone ~ along with several more super BEST IN GROUP wins. 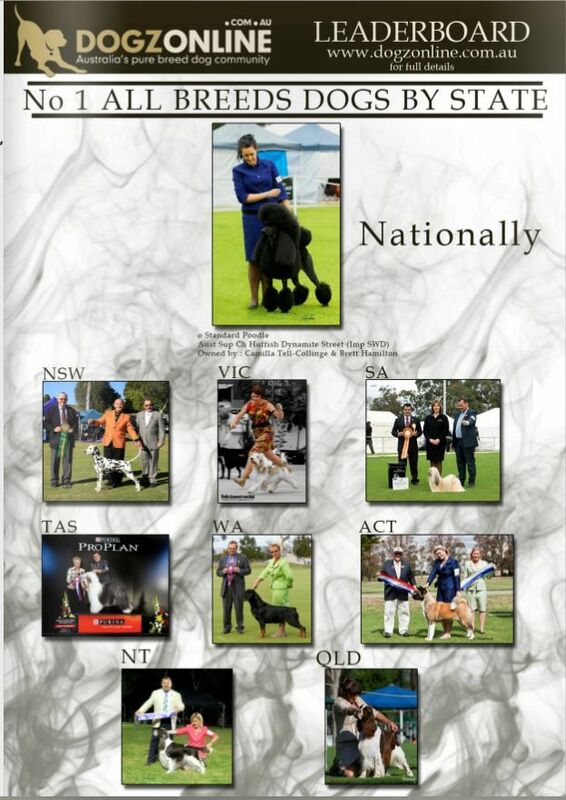 A summary of the NT Winners of 2014. 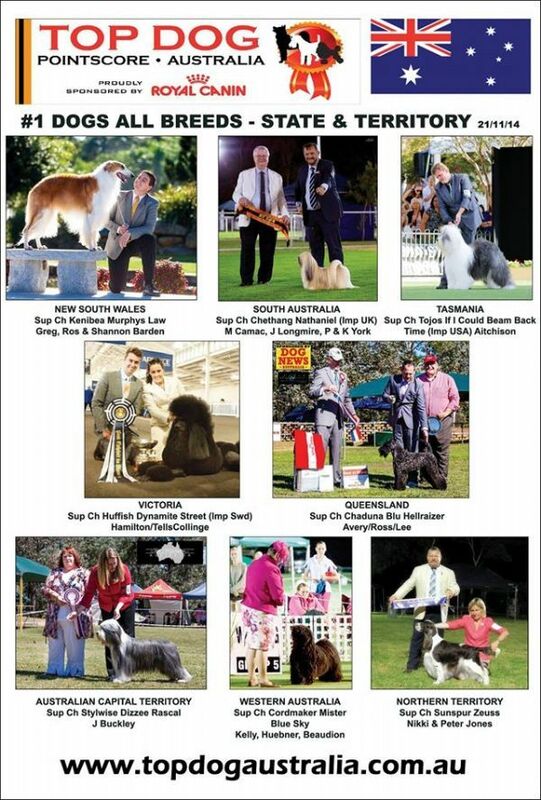 Zuess is the only dog pictured here twice & won All Systems Pointscores NT 2014 (DOL & TopDogs) again, with a staggering; 4 X BEST IN SHOW wins, 5 X RUNNER UP BEST IN SHOW & a further 8 X BEST EXHIBIT IN GROUP wins! 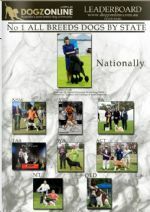 Zuess was comfortably sitting at #1 ALL BREEDS & #1 GUNDOG in August 2015 - as depicted here in the 'K9online' Magazine. 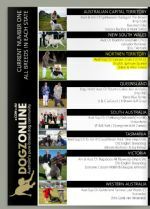 He went onto be the eventual winner in both the 'DOL' & 'TopDogs' Pointscores for 2015. 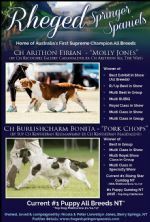 Molly Jones (Ch Arithon Eirian) was sashed BEST EXHIT IN SHOW at the May 2017 ASKDSC Ch Shows when shown to Ms. Kerryn Harvey (SA)! 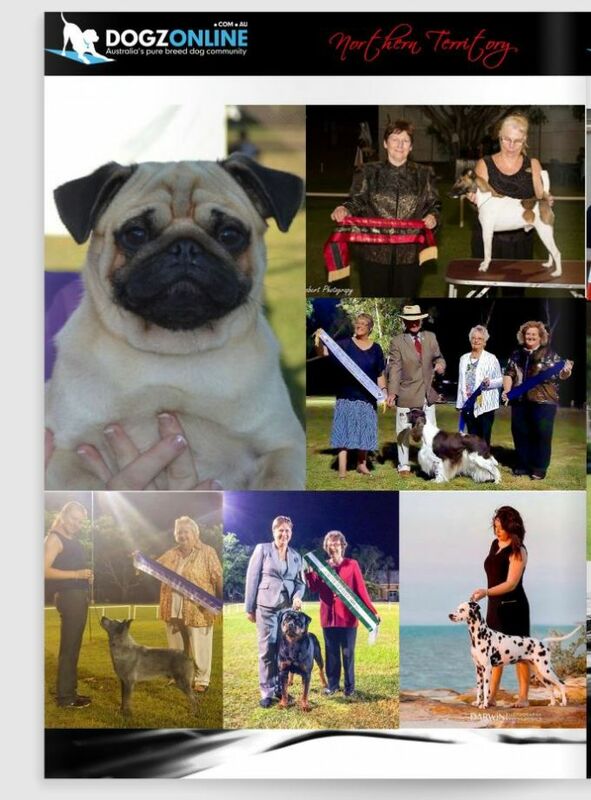 This was her very first BEST EXHIBIT IN SHOW win & followed a super BEST EXHIBIT IN GROUP win at the same show. 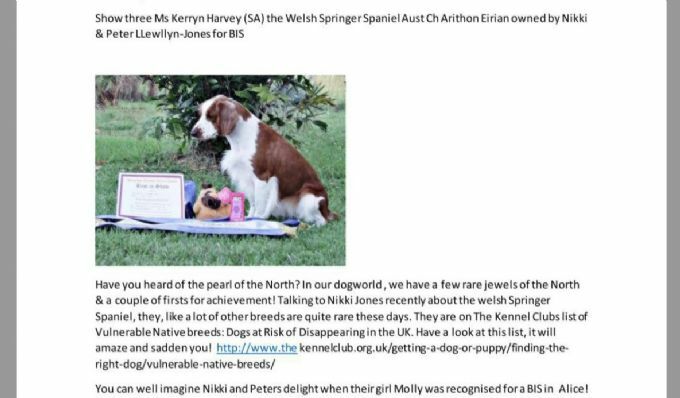 This editorial appeared in the 'K9 Online' Magazine - May 2017. 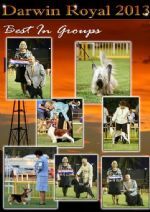 Meazle winning yet another BEST IN SHOW ward under Judge Mr. Graham Kerr (SA) at the DLKC Ch Show on the 24th April 2017. 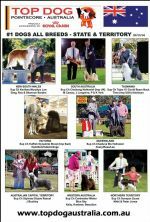 This editorial appeared in the 'K9 Online' Magazine - May 2017.